Is there something compelling that a series of cutting-edge art interventions exploring public space in Johannesburg can tell us about cities, imagination and the public sphere? Kim Gurney reflects upon ‘New Imaginaries’ to explore the connection: curated through walking, the politics and poetics of migration; via gaming, punk technologies and play; and performance art activating transport lines. The projects link city space to the public sphere to render otherwise illegible urban forms and flows. In so doing, they suggest public space as common space instead, public art towards an art of the commons. This musically inflected book includes a snapshot of recent performance art in central Johannesburg, a silo-breaking chapter on artists and uncertainty and a closing track to place the author in situ. The account ultimately positions itself as a public policy riposte in favour of economic invisibility- that art counts even when it cannot be counted. 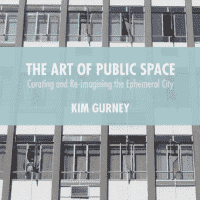 The Art of Public Space is an outcome of an exploratory research project conceived by ACC and the Goethe-Institut and falls within the Urban Humanities hub of ACC. More info about the project here. Read a review of the book by the London School of Economics and Political Science here.